We like you to know exactly what you will pay up front. That’s right, we use a flat rate appointment fee structure. There are no hidden fees, added fees, or pressure to spend more money. We hate the idea of using a low quote price to get in the door and then pressure you for more money… it’s just awkward. 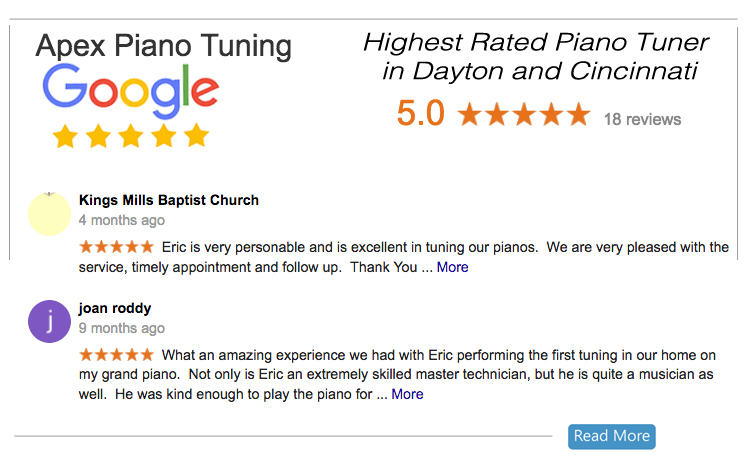 Our services below include everything listed and we offer a line by line written condition report with clear estimates for any additional work we feel would be helpful to improve your piano beyond tuning. We also never pressure you into something you don’t understand and we provide an online learning center with PDF downloads so you can think about it and make an educated decision based on your musical needs. We also offer you sweet rewards if you tune your piano consistently and we send you post card reminders and emails to keep you on track. Do you have questions? Contact me and let me know by email, phone or text! I will stabilize the piano to A440, adjust your pedals, lubricate the action as needed as ease your keys. This will lay a solid foundation for the stability and future care of your piano. I will inspect everything inside your piano and email you a complete condition report. This condition report will help you understand the current condition of your piano and includes quotes and suggestions for the future care of your piano. 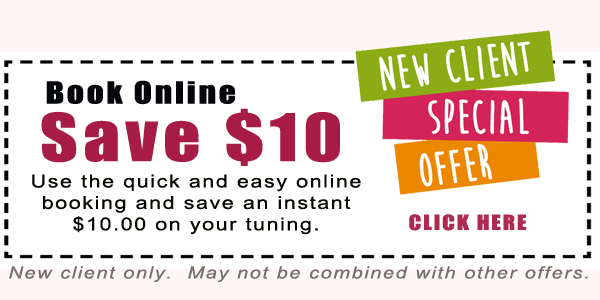 Save $10 and book online right now! Why such a sweet reward? It’s better for your piano! It’s better for your ear! Do you have sticking keys? A sticking key can be as simple as pulling a lost pencil out of the piano action OR the sticking key could be a symptom of a much larger problem. Either way we can fix it! For minor repairs that take less than 5 minutes we do not charge anything additional during a tuning service. When more extensive repair work is needed we bill at a rate of $25 per 15 min increments. Don’t worry, we always talk first before we do additional work. What if there are major problems with your piano?